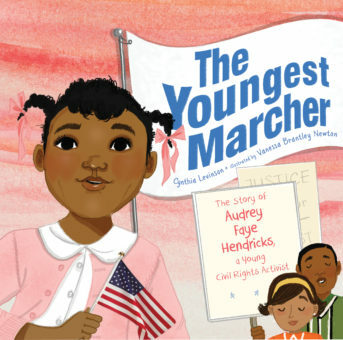 Synopsis: This is based on the real story of the youngest known marcher in the Children’s March — it tells how she learned about injustice not only from personal experience but also from greats like Martin Luther King, Jr. and others who often ate at her parents’ table and talked about their work. One day Dr. King talked to a large group in her city and called for marchers. Hardly any adults were willing. He and the other organizers decided to try a Children’s March, and Audrey was eager to march and go to jail — which she did. At 9 years old, she spent a week in jail, and their march helped move the civil rights quest forward. What an amazing girl! Learn more about Audrey Faye Hendricks through an interview with her (as an adult) on PBS Learning Media’s website. Learn more about the Children’s March (also known as the Children’s Crusade) from the National Museum of African American History and Culture, and read an article from the New Yorker published in 2013, 50 years after the Children’s March. This entire website is about the Children’s March. A Mighty Girl featured this book some time ago. See the Publishers Weekly review here. Here’s the author’s website with the trailer and many links to activities. Availability: Readily available. Ask at your local (or online) indie bookstore. You are most welcome, Cynthia! Thank YOU!